The e-STUDIO 477s / 527s are highly efficient and reliable monochrome A4 systems, which deliver outstanding document quality. Fine lines and tiny dots are reproduced with exceptional clarity and sharpness. Whether text or images, whether monochrome prints and copies or colour scans – the documents created with these systems will impress. Both systems are network capable and offer advanced print, colour scan, copy and optional fax functionality. With a print speed of 47 and 52 pages per minute respectively, they ensure that even larger print jobs can be processed in a timely manner. Various options enable you to configure a tailor-made system. By adding additional paper sources you can increase your paper capacity up to 3,160 sheets. Stapling can be made available via the offline stapler, which can staple up to 20 sheets, or via the inner finisher, which can not only staple up to 50 sheets automatically, but also functions as an additional output tray with a 500-sheet capacity. 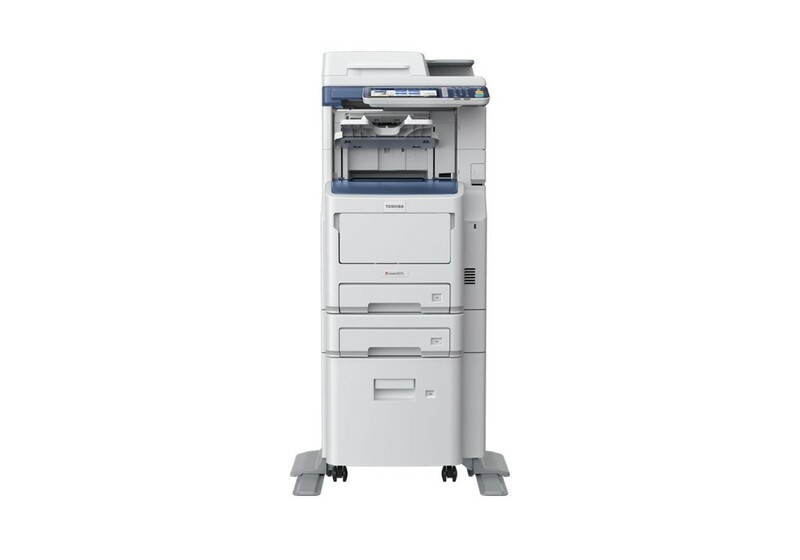 And to optimise your digital document workflow Toshiba offers a large range of software solutions. So whatever your needs – the e-STUDIO systems will always be a perfect fit. The state-of-the-art technology these models are based on ensures in seamless intergration into existing networks and utmost flexibility when it comes to adding software for more efficiency. At the same time the systems are intuitive to use and and easy to administer. Environmental issues are becoming more and more important in today’s world. Businesses try to reduce their impact on the environment and Toshiba helps achieve this. Duplex printing to save paper and energy save modes to reduce the power consumption are just some of the features of the e-STUDIO 527s to minimise the use of valuable resources. Both models fully comply with the ENERGY STAR® emission standards. Easy access to all print, scan, copy and fax function via the intuitive-to-use colour touch panel. Storing individual templates helps enhance efficiency. Excellent image quality at a speed of up to 52 pages per minute for impressive documents. Optional finishing covers all needs of modern businesses. Sophisticated e-BRIDGE technology for seamless intergation into existing networks and easy administration. Unparalleled data security with the Toshiba Secure HDD. Confidential company data is protected from falling into the wrong hands. These two systems can handel even the most demanding print jobs thanks to a paper capacity of up to 3,100 sheets.